Art Rising is Saturday, May 6, 2017. FREE! 10am - 5pm. It's here! Urban Craft Uprising's vendors are locked in for Art Rising. Check out who will be in attendance! Check out the local artists that will be at #ArtRising! Stay tuned for updated! We are very excited to be partnering with Urban Craft Market, Khambatta Dance Company, the SLU Saturday Market, Seattle Parks & Recreation, and Friends of Denny Park for this event! Thank you to Wunderman Seattle for the creative content and style guide and to Papuga Studio for putting the poster together! 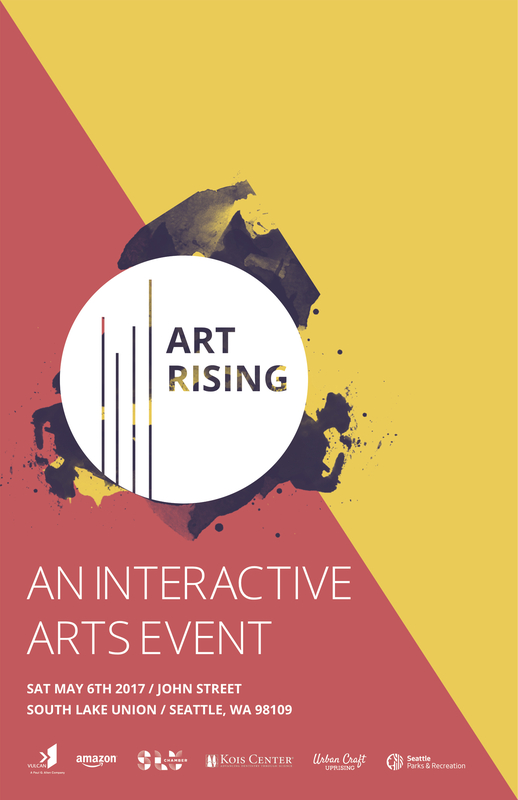 Art Rising is an interactive art event taking place for the first time in South Lake Union on Saturday, May 6th. Bring your friends and family to SLU and interact with the artist booths, celebrate the reopening of Denny Park with the Mayor and peruse the South Lake Union Saturday Market on its Opening Day of this year's season! Check out live performances in Denny Park from Khambatta Dance and see what is for sale at Urban Craft Market's vendor booths! Thanks to Recology CleanScapes for providing waste services for this event! The fun begins at 10am. Come celebrate your local artists, food vendors, craft vendors, and neighbors! Art Rising is all about connection. It's about making people feel that they belong - to their neighborhood, to their community, and with the artists who are willing to share their perspective with the world. We'll create these connections on a 1-to-1 level by giving attendees the opportunity to be a part of the art itself through actual physical interaction. We will customize a sponsorship package based on your needs. Below is a list of suggested items for your sponsorship package. Opportunity to brand a specific area of the event as the "Organization name Art Alley/Zone/Street"
Organization name and logo prominently displayed on all event advertising, including social media, radio, print ads, event signage and programs as "Event Presented By"
Organization name and logo prominently displayed on all event advertising, including social media, print ads, event signage & programs as "Event Presented By"